BioWare is taking another stab at Mass Effect 2 action figures with a brand-new dance partner. Back in March, BioWare had a bit of a blow-up with DC Direct, the collectibles division of DC Comics that was contracted in 2010 to crank out some Mass Effect 2 action figures. Originally supposed to come out in August 2010, they were at the time pushed back until April 2011 and although the first series eventually did make it out at some point [and then disappeared quickly and quietly], the second series was canceled outright. But gone is not forgotten and BioWare is ready to try again, this time with Big Fish Toys. 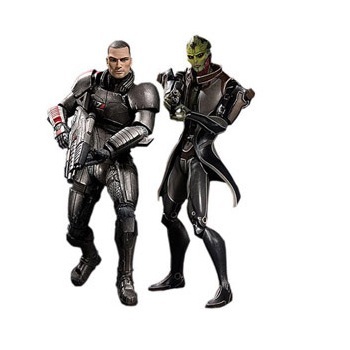 Big Fish is resurrecting the first series of action figures - Commander Shepard, Thane, Grunt and Tali - and will also give life to the second series that never was: Garrus, Legion, Mordin and Miranda. Both series are available for pre-order now from the BioWare store, but be warned that these probably aren't the sorts of toys you'll want to let your kids play with in the mud pit out back. Each set of four action figures lists for $75 plus shipping. Both sets are currently estimated to be ready for release by April or May of 2012.